Fried Bubblegum! This was the big hit this year. Everyone was talking about it. 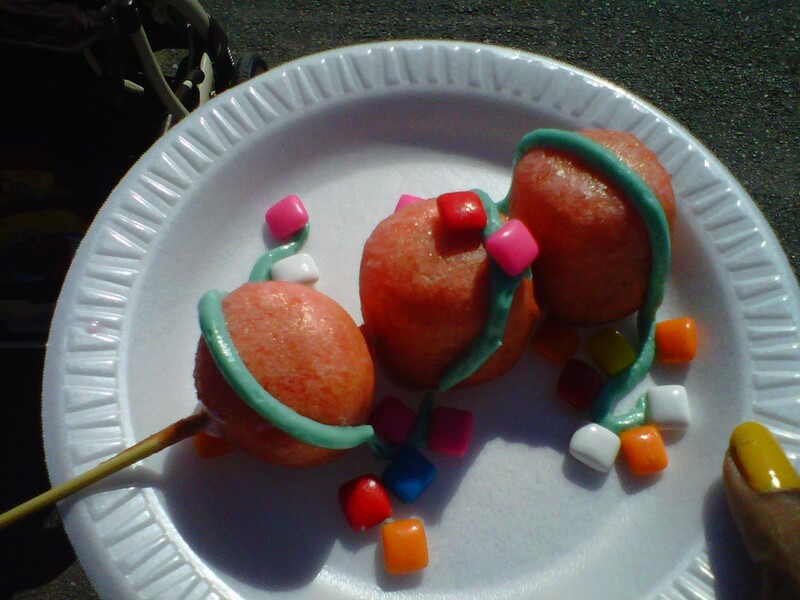 Even people that hadn’t been to the fair were talking about the fried bubblegum. I just hate when things don’t leave up to the hype. Fried bubblegum wasn’t a party in my mouth at all. Fried bubblegum was like getting a balloon being really happy with it and then someone pops it or like buying an ice cream cone walking away and dropping the ice cream before the first lick. It was such a fail for me. It tasted like hot bubblegum flavored marshmallows. As I ate it people walked by gawking at me and trying to see my reaction. I tried to stay calm for the people around me. I gave a thumbs up even though I really wanted to throw up. I later passed by the bubblegum stand and saw many people have this reaction on their faces that was the same one I would have had if there hadn’t been a crowd watching me eat. It was a very upsetting taste, but at least I can say I tried it. Fried Gator… nothing uber special about fried gator because most of the southern world as had fried gator or heard of having gator. To me, a northerner, who loves watching Swamp People having gator was an experience I would pay big bucks for. Now, I’ve heard that gator tasted just like fried chicken and it did. 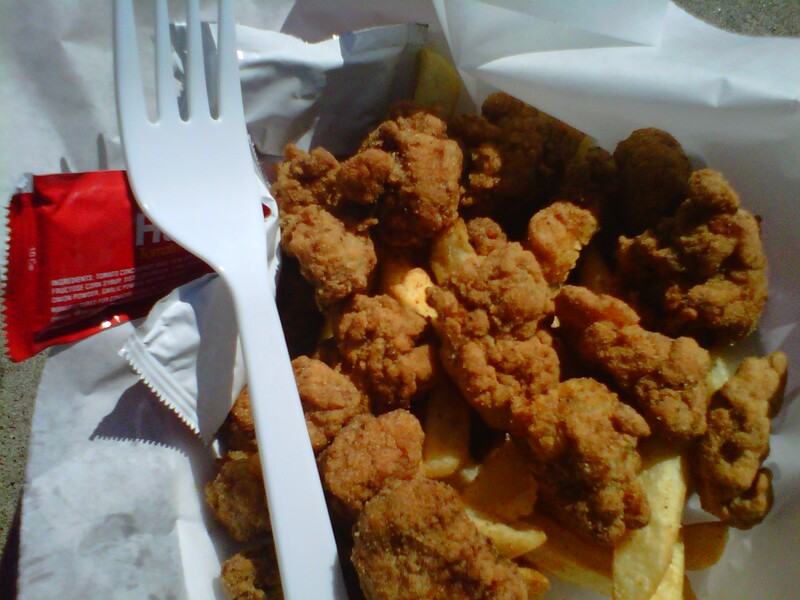 Though, I can’t be sure if these people just gave me chicken or they actually gave me gator. Biting into the meat I couldn’t really see exactly what it looked like. I know that’s wrong to just put something in my mouth because someone says it’s gator and believing them, but whatever. The gator could have been cooked in fresher grease. I think the seasoning was too strong for me to be able to taste the meat the way I’d like to. I think what I really need to do is have fresh cooked gator after someone has just caught it. Don’t kill me for loving meat, Peta! (: I put the smiley face to make everything better. Hope it worked. I look forward to eating gator another time. When I saw that these people were selling fried butter I said to myself that’s the weirdest thing. You’ll have to get that because it’ll shock people when you say you’ve tried it. I tried it and I wanted my money back on the spot. I didn’t ask for my money back, but man it sure wasn’t worth it. 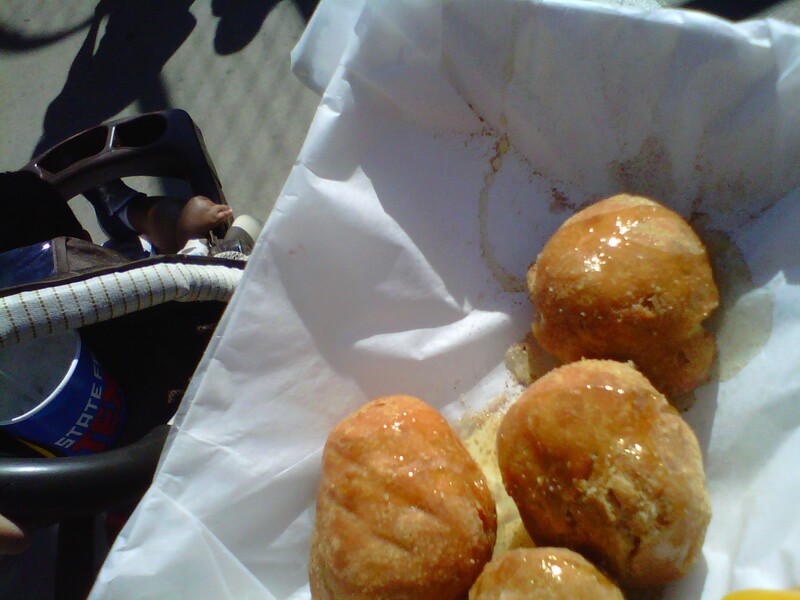 Fried butter is basically a biscuit turned inside out. They put butter inside of dough and then put a flavored syrup on the outside. For my syrup I choose maple honey cinnamon sugar. I really didn’t enjoy them. My friend that was with me enjoyed them more than I did, but after one of them I totally could not get another one down. Thanks for the experience, but never again well I try that. Though, this wasn’t the worst I had all day. 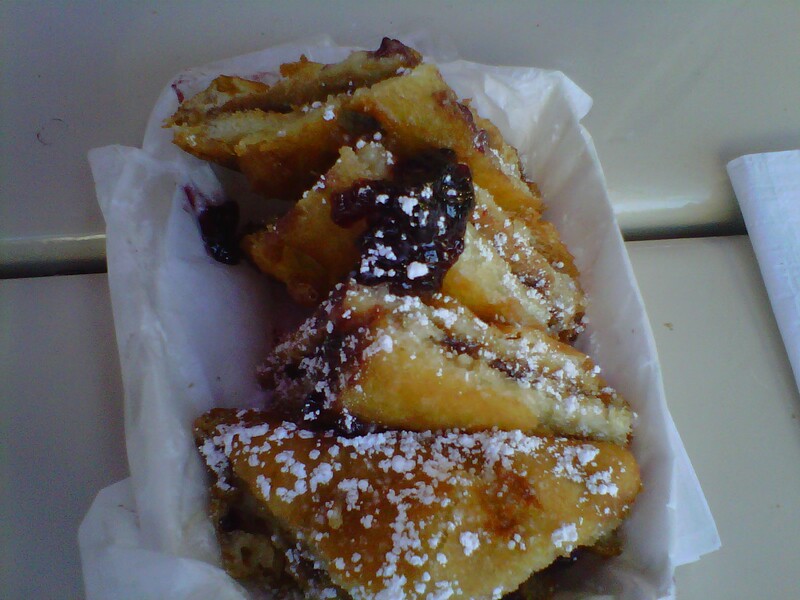 Fried Peanut Butter and Jelly sandwich. Can you hear heaven’s angels singing? Oh, wait that was just me. When I saw the sign for fried peanut butter and jelly I almost died. I started to sing and dance. I had heard so much about this sandwich. I had seen famous people eat this sandwich. I had seen it on food channels. So, this sandwich had a lot to live up to in my mind and it definitely did. First off unless you plan to only eat this all day I recommend sharing with someone else. I had a friend there with me to help eat this amazing creation. If you love peanut butter and jelly there is absolutely not reason why you wouldn’t love it fried. It’s such a simple idea that makes such a simple sandwich so much better. Of course the day after the fair I was in the kitchen cooking fried peanut butter and jelly sandwiches. Extremely easy to make, doesn’t take long and doesn’t take a gourmet chef to make it either. Now, I wouldn’t recommend having these for every meal even if you use wheat bread. Anyways , totally enjoyed that and it lived up to everything and more. Did I just see heaven land on earth? I think I did. Fried Poptart was another creation that I had at 10 o’clock in the morning. The same man that gave me fried salsa gave me a fried Poptart as well. Although you cannot see it because of all the whip cream there is a smores Poptart underneath it. I’m definitely not a whip cream person, but because it’s a creation and I have to try everything as it is I had the whip cream too and OMG! Totally had a party in my mouth. 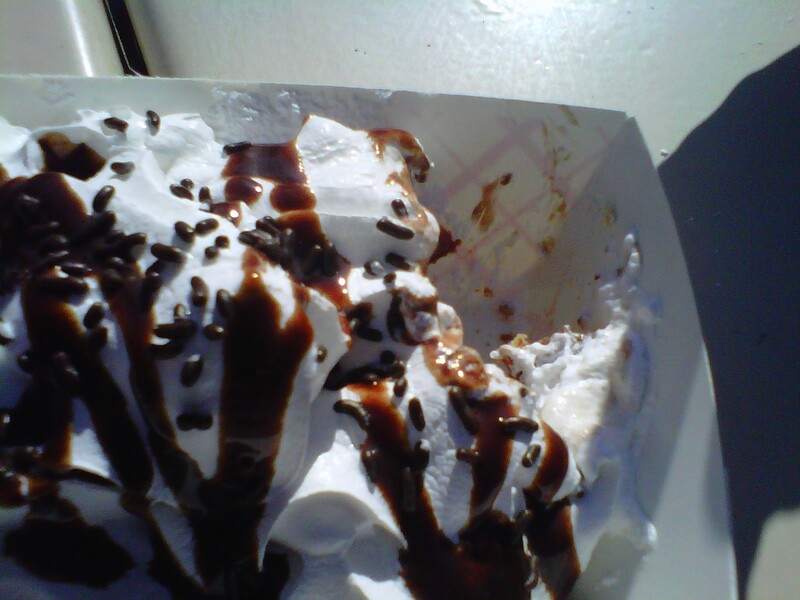 I had a feeling that fried Poptart would be overly sweet and the whip cream, sprinkles, and chocolate syrup would definitely give me heart trouble on the spot, but it didn’t. It was unusually calm in the sweet department. I can never look at a Poptart the same way. Every time I see a Poptart I feel like it has so much more potential. I will probably end up trying to cook this one in the future. Pray that I don’t burn down the house! Fried Salsa! Bless the energetic man behind the counter that told me to try this. At the Texas State Fair unique foods is the name of the game. Fried Salsa was one of the best fried foods I tried all day. It’s also one of the foods I wish I could make in my kitchen, but I feel intimidated. It was 10 o’clock in the morning when we arrived at the fair and it was 10 o’clock when we tried this creation. Some people went in there with the mindset that it’s too early to eat fried salsa, but my mindset was it’s never too early to try something new! 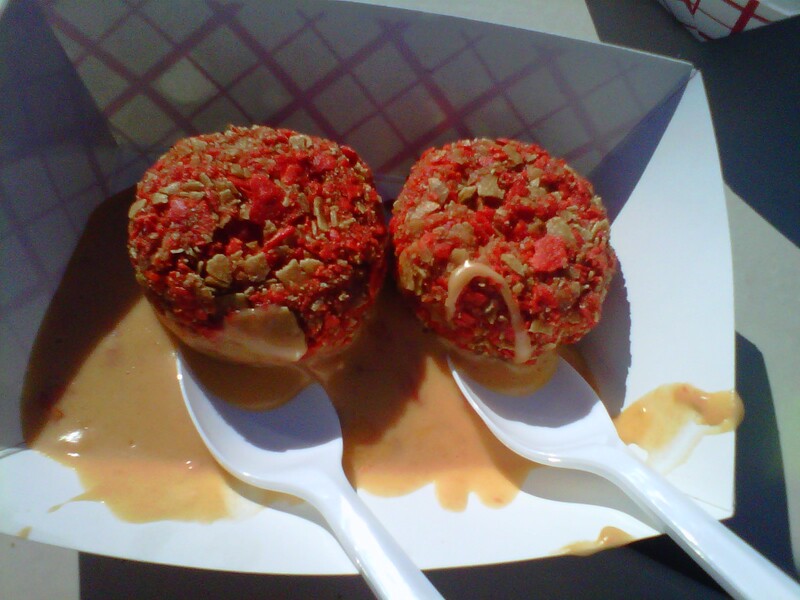 Fried Salsa is salsa encased by tortilla chip crumbs with queso sauce on the outside. An extremely brilliant idea and a tasty one too. Lovedit! I’m here in Texas this month enjoying everything that Texas has to offer. 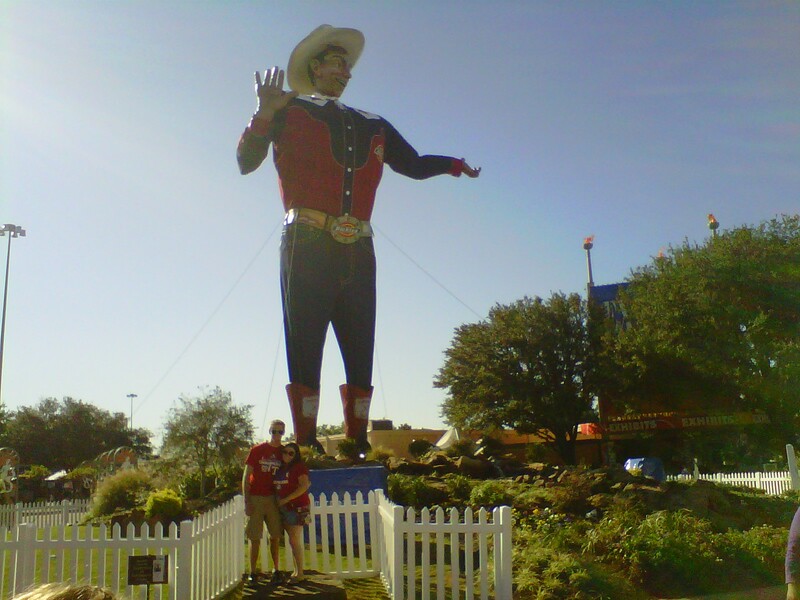 I was confused about Texas even as I made my first journey from the airport to the house I am currently staying in. There seems to be one giant highway that goes down the middle of Dallas. Then, there are sub counties or smaller towns. I’ve been all over the small little towns. I was in Little Elm, The Colony, Frisco, and more that I can’t remember the name of. The one thing that has been a big theme of my trip here is to try the food. Since I’m from Northern Virginia a lot of these fast food places aren’t familiar to me. Every time I tell someone I haven’t been to a certain place they look at me shocked as if my whole life has been a lie or a waste. It’s not that I’ve been under a rock it’s that the 13 original colonies have no room to build anything else because every piece of land is historic! Anyways, there’s a pretty blue sky with no clouds in sight and the sun is calling my name!